Imagine a place where you are met at the airport by your own private Butler who welcomes you, takes your luggage and that is just the start of being pampered at Thalassa. Imagine a place where you are met at the airport by your own private Butler who welcomes you, takes your luggage and then after settling you into the limo, offers you cool, lightly lemon scented cloths to refresh your travel weary skin, and provides you with slippers and a cooling spray to cool and refresh your feet. Where you are further pampered with a choice of champagne, fresh squeezed orange juice or mineral water, all served in sparkling crystal. Imagine a place where the sky and the sea are the most remarkable shade of blue, where the country is rich in history, mythology and antiquities. Fantasy? No, the place is Cyprus and the hotel is Thalassa. Thalassa, www.thalassa.com.cy a member of the Small Luxury Hotels of the World www.slh.com and the Great Hotels of the World www.ghotw.com, is the first luxury boutique hotel in Cyprus with 58 exquisite rooms and suites located on a bluff overlooking the Mediterranean Sea. 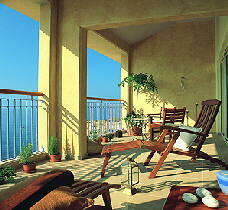 This gorgeous boutique hotel just opened in July 2004, and is ready to start guest pampering. Ed and I had the splendid opportunity to see, taste and experience Thalassa in late May 2004 before the official grand opening, and it was definitely an experience that we would like to repeat as often as we can. General Manager, Marc Aeberhard, from Switzerland, whose impressive career includes 4 openings in 5 years including the boutique Hotel Stadthaus in Burgdorf-Bern, as well as the Hotel Soneva Gili in the Maldives, has made him a hotel “opening” expert, must be credited with assembling a remarkably talented team, where the hotel motto is “The answer is yes, what is the question?” Australian Hunter J. Reynolds, is the Executive Chef whose impressive credentials include working at Spa Hotel Chiva Som, Hua Hin and Santiburi Koh Samui, Thailand and winning many international awards before joining Thalassa. New Zealander Barry Warrington is Spa Director for the innovative Holistic Spa, whose impeccable career includes having worked as the manager of the prestigious Health Club on Kensington on High Street and acted as personal trainer to the late Princess Diana, and Duke and Duchess of Gloster, also worked at Spa Hotel Chiva Som in Thailand for two years, before managing the Six Senses Spa at Soneva Fushi Resort & Spa in the Maldives. South African Frederick Broodryk, attended Butler school in Capetown and later had the opportunity to host Nelson Mandela for a considerable amount of time, before he joined the Saxon Hotel as Head Butler, and later as Head of the Butlers Department at the Soneva Fushi Resort & Spa in the Maldives, is responsible for the training and management of Thalassa’s unique all-Butler concept, the first of its kind in the Mediterranean area. In addition to a remarkable team of executives, the knowledgeable international Butler staff also deserves high praise in their enthusiasm and dedication to making each guest’s stay a memorable one with their specially designed Spa, exercise or cultural programs. 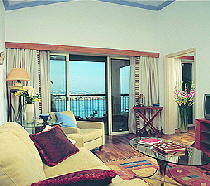 Thalassa is a hotel where once it is experienced, warrants many repeat visits. To read our other articles on Thalassa and Cyprus, please read Destinations, Chefs' Recipes, Music Scene and Art & Antiques. © September 2004. Luxury Experience. www.luxuryexperience.com All rights reserved.